Our goal at Heatmizer® is to capitalize on the energy you have already purchased so that you see savings to your bottom line. 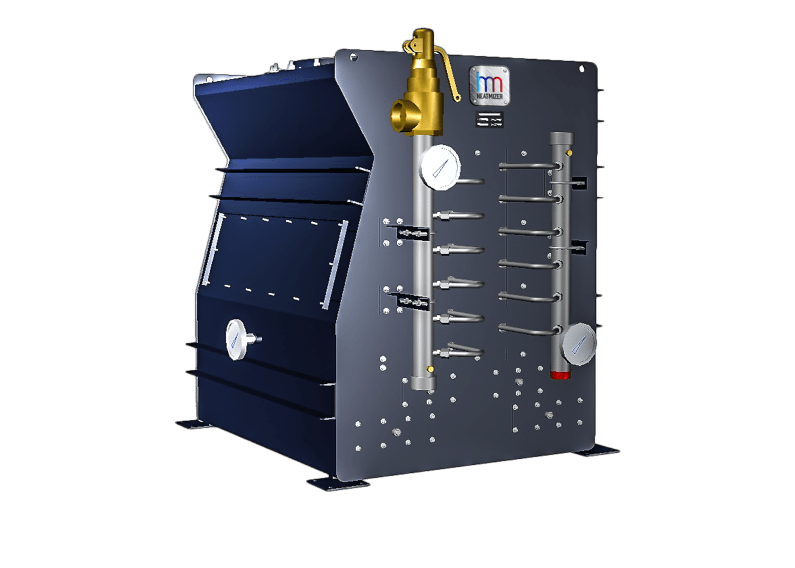 The Heatmizer heat recovery system transfers waste heat from boiler exhaust gases and uses that energy to preheat the boiler feedwater. The effect is a decrease in fuel energy consumption for a given steam demand so you see maximum annual savings. Heatmizer is designed with corrosion-resistant materials, requires a simple installation and is built to support easy maintenance, so that it can operate in even the most demanding conditions. With its compact design, the heat recovery system can be installed on top of your boiler without cluttering the space within your boiler room. With our standard pricing, you receive a flue gas inlet mounting flange adapter plate that will be field welded to the existing boiler as well as an outlet mounting flange ring that may be field welded to the stack. If your boiler does not meet the standard sizing (shown below), ask us about making one to fit your requirements. Condensing applications (entering water temperature under 120°F) require SS stack and condensate pipe to drain.